Being close to the water is everything on the Gold Coast and our new luxury addition to Mermaid Beach is set to take perfect advantage of that. With development approval granted, construction will start next year on Bela by Mosaic at 43 Peerless Ave, Mermaid Beach. For Mosaic, the location for all our sites is critical to the enduring value of our buildings. Bela is only 150 metres from the Mermaid Beach entry off prestigious Hedges Ave.
People buy in coastal regions to get that emotional connection to the water. Bela brings the beach to you, with highly coveted coastal views that will be protected along both the north east and south east coastline, as well as offering views of the hinterland and mountains in the south west. Bela was designed by nationally renowned architecture and design firm Rothelowman, with a brief to pay homage to the days of original beach shacks on the Gold Coast in the fifties. Whilst the inspiration responds to a yearning for simplicity and freedom, the design is focused on delivering an unsurpassed luxurious residential experience. The architecture is distinctive, timeless and in harmony with its iconic coastal location. The apartments have a seamless connection from the spacious living areas to the expansive balconies. This is achieved through high ceilings and full height windows and doors that frame the breathtaking views and bring the ocean inside. 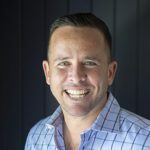 Attracting interest from both investors and owner occupiers who have been particularly keen on the higher-level residences, Bela’s larger percentage of current registered interest is coming from local owner occupiers. Bela features an unparalleled level of amenity and residents will be left with nothing to wish for. Including a large resort pool, spa, steam and sauna, a commercial quality gym and dedicated yoga space, secure bike storage, residents’ deck, executive lounge, and concierge service. There is also an exclusive club on level 25 which hosts a wine cellar, private dining rooms, kitchen, beautifully appointed library, lounge and media room. The ultimate in entertaining spaces, this deluxe top floor will leave your guests speechless with the impressive 360-degree views of the Gold Coast. Lavish and clever interior design brings indulgent opulence to every residence. High quality brand finishes and appliances, engineered oak timber floors, custom joinery and stone benchtops throughout, high ceilings, fans and fully ducted air conditioning. 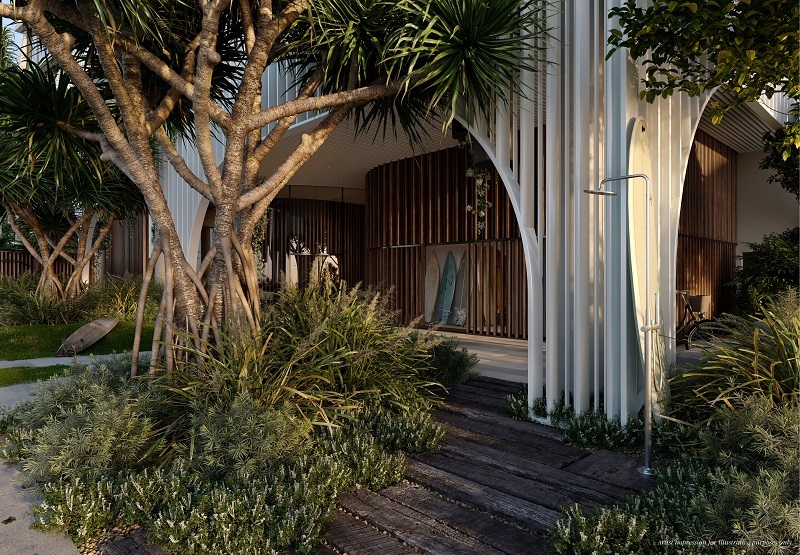 The design aesthetic sets a new benchmark in Mermaid Beach for luxurious living. Prices for two-bedroom apartments start at $565,000, three bedrooms start at $1,015,000 and the sub penthouses start at $1,730,000. Penthouse prices are on application. For more information on Bela by Mosaic, register your interest here, visit our showroom at 18 Albert Ave, Broadbeach, or contact our sales manager on the details below. 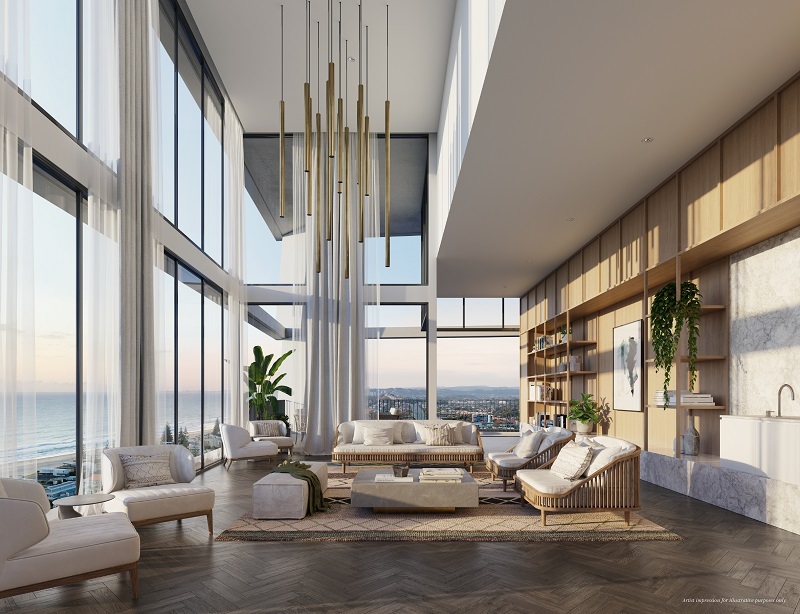 Mosaic is a multi-award-winning developer, taking out the prestigious UDIA Qld Design Excellence Award, among a host of other awards, to become UDIA Queensland’s most awarded developer in 2018. * Artist impressions for illustrative purposes only. Views indicative only and views will vary accordingly with each apartment. Finishes shown are indicative and vary accordingly with each apartment type.